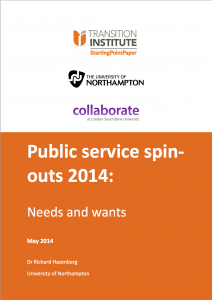 Public Service Spin-Outs: Needs and Wants is an exciting new report being launched today in partnership with the Transition Institute and the University of Northampton. The report takes the temperature of UK spin-outs and asks critical questions around this fast emerging sector, assessing it needs, wants, obstacles and aspirations within public service delivery. This report was launched on 7 May 2014, with an expert panel and contributions from Lord Victor Adebowale, Chief Executive of Turning Point, Professor Julian Le Grand, London School of Economics, and Matthew Taylor, Chief Executive of Royal Society of Arts. 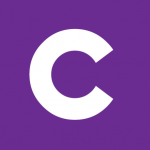 Collaborate is an independent social business supporting cross sector collaboration in services to the public. We are a ‘shared space’ specialising in creative thinking, changing culture and supporting innovative practice. We work with individuals, organisations and systems who want to collaborate to achieve better outcomes for citizens.